People who are over 40 love [Episodes] IV, V, and VI and hate I, II, and III. Younger people like I, II, and III and don’t like IV, V, and VI, or they like I, II, and III better and think IV, V, and VI are kind of boring and slow. And of course the older people say, “Oh, I, II, and III—it’s too jittery, too fast, too complicated, it’s too digital,” or whatever they want to say. But definitely one generation has grabbed hold of one of them, and the other generation has grabbed hold of the next one. One of the key characters that helped us realize what was going on was Jar Jar Binks, because the kids that are under 10 years old, he’s one of their favorite characters. For people over 40, they cannot stand him—it’s a hate thing. You know, they’ve always been for 12-year-olds, and that’s never changed. People don’t want to think of it that way. They want to think those films are for grown-ups. Even though they were 10 years old when they saw it, it’s still very important to them, so, for them, it’s a grown-up movie, as opposed to a kids’ movie. The pre–Jar Jar Binks was 3PO. Everybody hated 3PO. I mean, it was like they couldn’t stand him. It really had to do with his character. They don’t like his character, and they don’t like Jar Jar Binks—but they’re not designed to be likeable characters. For the complete Lucas Q&A, read it online here. The Vanity Fair issue is on newsstands now. 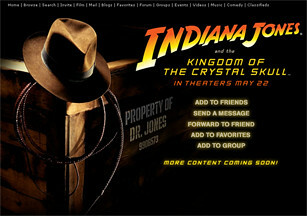 Indianajones.com, the official Indiana Jones website, has posted the teaser poster for Indiana Jones and the Kingdom of the Crystal Skull. Indy rides again on May 22. 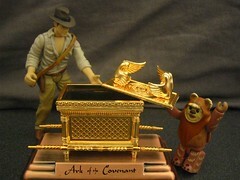 For more updates as we count down to the big day, keep checking Indianajones.com. You can also buy the teaser poster here. Indiana Jones: That’s a Wrap! Principal photography has ended on Indiana Jones and the Kingdom of the Crystal Skull and director Stephen Spielberg raises a glass to cast and crew in a toast. Take a look at the latest video clip that pays homage to the wraps of all the Indy movies in the VIDEO section of the newly redesigned IndianaJones.com. Unless you’re living in a Chachapoyan cave you’ve probably heard that a bunch of production materials — photos, computers, etc. — from the new Indy movie were stolen recently. While this story seems to be wrapping up with the apparent apprehension of a suspect, it does recall a similar incident that occurred back in 1977 before Star Wars was released. You are currently browsing the archives for the New Indiana Jones category.